After a school year spent preparing for future careers in the board room, members of the Scott College of Business' Networks Professional Development Program learned a little about proper play on the golf course a week before finals. "Being able to play golf and be professional on the course is always a good thing to learn in business," said sophomore insurance major Ryan Polito of Schererville. "It is also an event that helps us, as Networks Scholars, to have fun and build relationships with other students who are in the program." The team volunteered to provide the 52 scholars with advice including picking clubs, navigating the course, tips for etiquette, and producing the best swing during the nine holes they played. "I like helping people learn to golf because it reminds me just how hard golf can be to pick up on if you've never done it before," said Sophia Bennetti, a freshman biology major from Orlando, Florida and a member of Indiana State's women's golf team who lent her expertise to the event. "It's a great game to learn because it teaches you how to be humble in a social setting and requires you to be polite for three hours." Some of the most important advice was offered by Greg Towne, head coach of the Sycamore women's golf team. "The important thing to know about golf in a professional setting is how to be courteous on the green," he said. "When you play three or four holes with someone, you really get a good look at their attitude and it can help you learn a lot about a person so you want to make sure you are playing correctly." Before hitting the course, students rotated through three practice stations - putting, etiquette, and chipping - to help them play their best game with the hope of nabbing a prize for the winning team. "We hope that this makes the students feel more comfortable on a golf course if they're invited to participate in an outing or play in a scramble," said Rebecca Wray, director of the Networks Financial Institute.It is practice that will surely help the students in their professional futures, too. "A lot of business gets done on the golf course in the business world, so this our chance to practice and learn skills that will help us play in a business setting," said Tanner Smith, a sophomore operations and supply chain management major from Fishers. "Playing golf in a business setting is about communication between you and the people you are golfing with, which are skills that we can really use on and off the course," added Chris Moghadam, a freshman management major from Cloverdale. "Plus, it's just fun to be out here on the course with everyone." 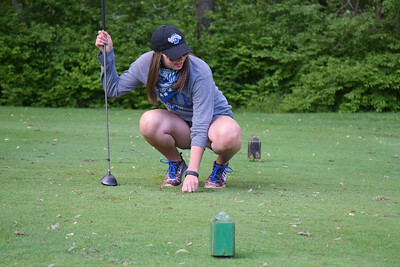 Indiana State's Networks Professional Development Program shows students how to handle themselves on a golf course during the annual event in late April.